Note: This description of the house was compiled in 1999. Photographs were taken by the author at that time unless otherwise noted. Attributed to A. Ten Eyck Brown and remodeled by Philip Trammell Shutze in 1933, Spotswood Hall is a two-story, wood-framed, Neo-Classical house set on a 2.07-acre lot on Argonne Drive in northwest Atlanta. Facing to the southeast, the house sits at the edge of a sweeping lawn atop a prominent hill top that falls rapidly away to the east and south. The original driveway, which left Argonne several hundred feet east of the present driveway entrance, ran in front of the house to a rear, service drive off Arden Road. 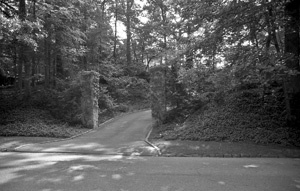 The original driveway entrance remained but, with Shutze’s changes to the rear, instead of running in front of the house, the drive was routed to the rear where a circular turn-about was designed for the porte cochere entrance on the north side of the house. 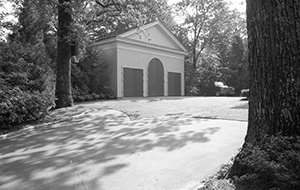 The existing driveway is modern and a garage was constructed behind the house in 1992, changes which were the indirect result of the Hill estate’s subdivision of the original property in 1968. Both of these changes and the modern landscaping of the site were well-designed to complement the historic setting and, in spite of modern development on the original 6-acre estate, the setting of Spotswood Hall remains remarkably intact. Figure 1. 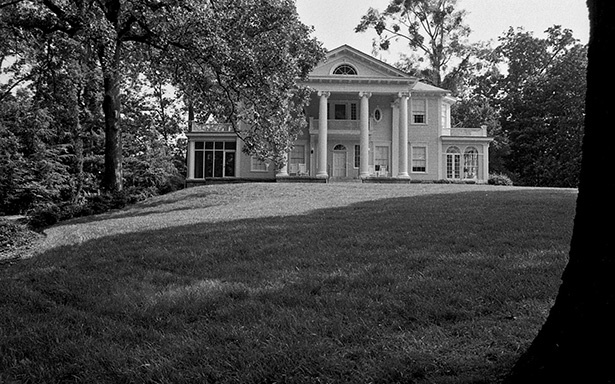 Spotswood Hall from the southeast. The original house consisted of a two-story, main block, five bays wide, three bays deep, with a one-story kitchen wing at the rear. 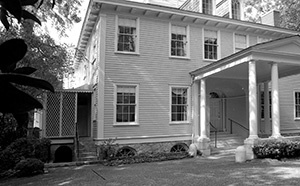 The 1933 renovation expanded the house in the rear but left most of the original exterior of the main block intact. 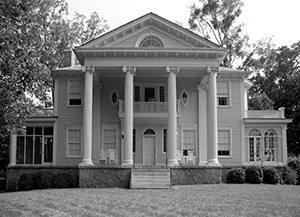 The house is fronted by the original pedimented portico supported by great Ionic columns. A one-story porch flanked the west side of the house and connected to the front portico by an open terrace, decked with terra cotta tile and extending across the front of the house. The cantilevered balcony above the front door and a two-story bay window on the east side were both features of the original house. The house was built on a rusticated granite foundation with brick chimneys and a main roof that was hipped to a balustraded deck at the top and finished with slate. The balustraded, flat roof of the side porch was finished with “tin” and exterior siding and trim were wood. Figure 2. 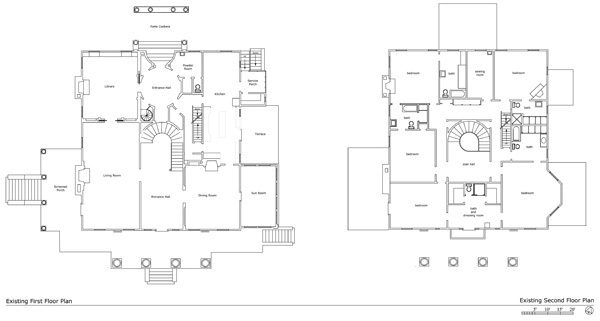 Plans of first and second floors of Spotswood Hall as they existed in 1999. Figure 3. Spotswood Hall from the southeast. Figure 4. Spotswood Hall from the southeast. Figure 6. Spotswood Hall from the northeast. Figure 7. 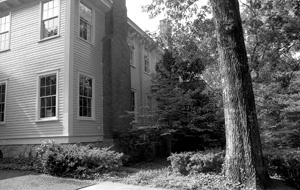 Northwest (rear) side of Spotswood Hall, redesigned by Shutze in 1933. Figure 8. Porte-cochere entrance, created by Schutze in 1933. Figure 9. 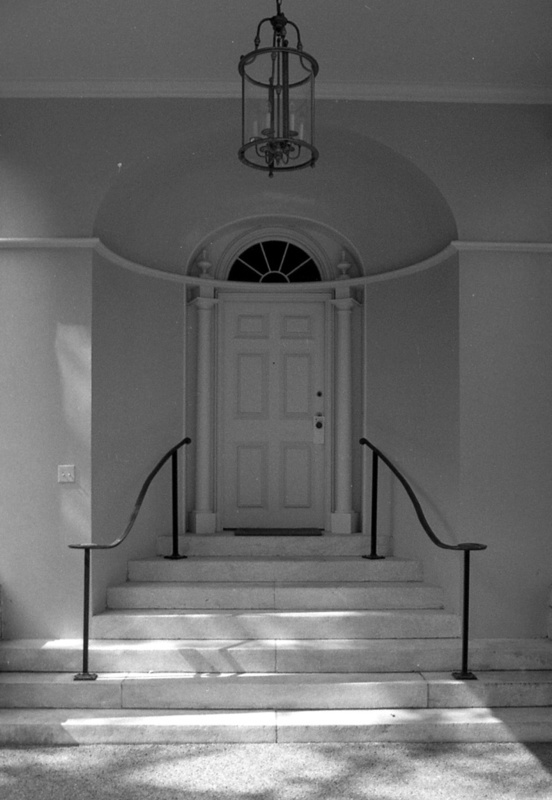 Porte-cochere entrance, created by Schutze in 1933. Figure 10. Southwest side of Spotswood Hall. Figure 11. Garage constructed in 1992. Figure 12. 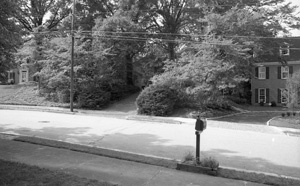 Original driveway entrance from Arden Road. Figure 13. 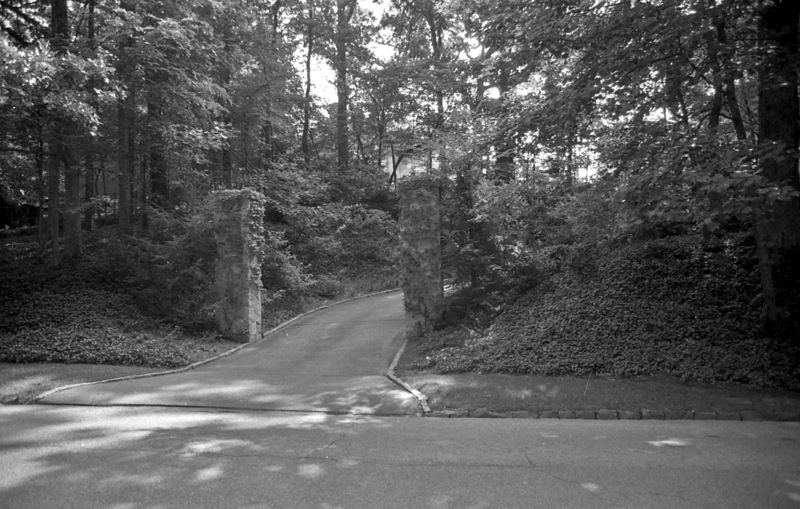 Driveway entrance from Argonne Drive. 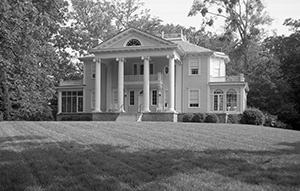 The 1933 renovation of the house did not substantially alter the original Neo-Classical design of the exterior, even as it enlarged the house from around 3,600 to nearly 6,200 square feet of floor space, and Shutze specified that the house’s original architectural detail be continued on the additions. He did, however, replace the original 1/1, double-hung sash with the existing 6/6 sash and he removed the lower story of the old-fashioned, two-story, bay window on the east side of the house, replacing it with a balustraded sun porch that balanced the original balustraded porch on the west side of the house. The original double, two-panel front doors were replaced with the existing six-panel door and the original fanlight and, probably, sidelights and oriel window sash were replaced as well. 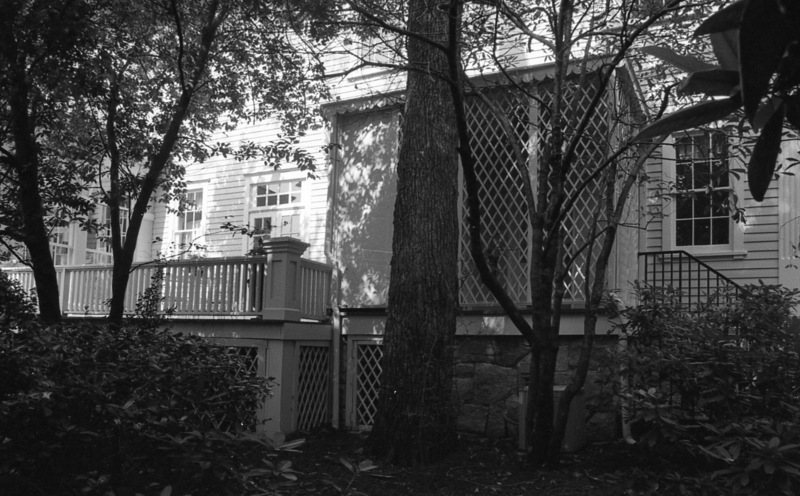 Shutze may have redesigned the house’s original roof balustrade, which is only barely visible in the early photographs, but the Shutze balustrade was itself removed, perhaps as early as the 1950s. The existing balustrade was reproduced from the original Shutze drawings by the present owners in the 1990s. 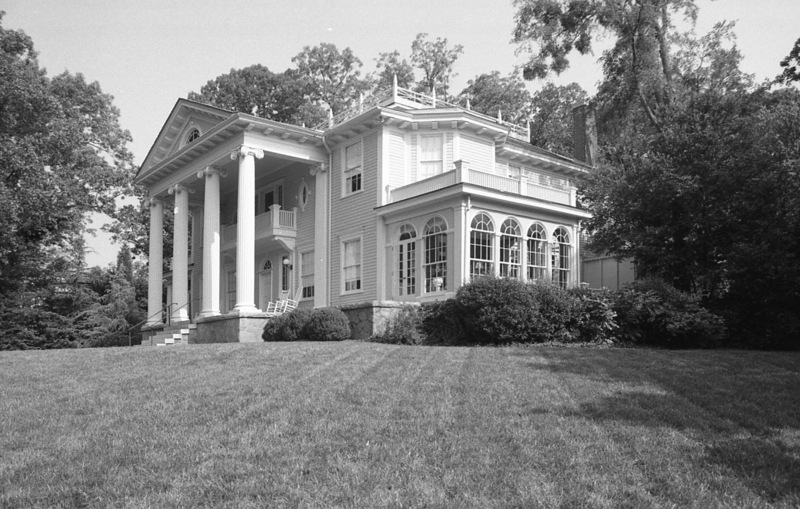 The rear of the house was redesigned in 1933, with the additions producing a new entrance to the house that features a one-story, pedimented porte cochere supported by four, wooden, Doric columns set on cut stone plinths. 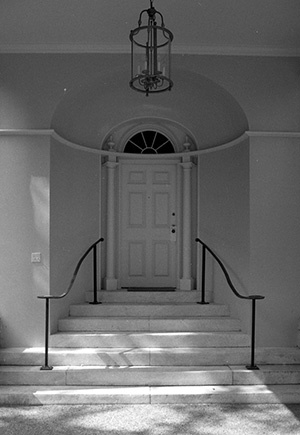 Entrance to the house from the porte cochere is through a semicircular, half-domed alcove and a six-panel entrance door that is surmounted by a semi-circular fanlight and is flanked by a pair of wooden, Ionic columns topped with large, turned finials. On the rear shed of the roof, Shutze added two dormers with round-headed windows and, at the basement, a series of semicircular windows that, with the shallow gable of the porte cochere and the overall design of the rear entry, suggests the Regency style which typified much of Shutze’s work later in the 1930s. 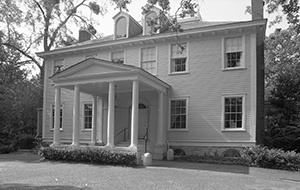 Behind Brown’s Neo-Classical facade, the interior of the house was gutted and radically altered by Shutze in 1933 with major changes to the original floor plan and an almost complete redesign of the interior. Much of the original rear (north) wall of the house was removed and, across the rear and against the original kitchen wing, Shutze added a new circular entrance hall or rotunda, a paneled library and a large powder room. The original staircase, which rose along the west side of the old entrance hall, was replaced by a curving staircase cantilevered from the east wall of the hall and rising to a second-floor stair hall that is lit by a circular skylight and colonnaded on its north side. In addition, Shutze removed the wall and fireplaces between the two rooms on the west side of the first-floor entrance hall and combined the spaces into a living room that is 34' feet long. 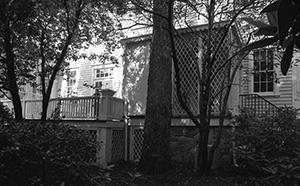 Construction of the sun porch necessitated removal of the original bay window in the dining room, which Shutze also redesigned. The original kitchen, scullery, butler’s pantry, and service stair remained in place in the northeast side of the first floor, but Shutze added cabinetry in the kitchen and pantry and an elegant service porch off the east side of the kitchen. On the second floor, the original plan featured two bedrooms on the west side of the stair hall, one bedroom on the east side of the hall and a fourth bedroom or sitting room at the south end of the hall and opening on to the front balcony. All of the bedrooms had closets and there was at least one bathroom and another sitting room in the northeast side of the second floor. None of the original spaces on this floor escaped alteration in 1933 as Shutze dramatically altered the floor and created his magnificent stair hall along with five bedrooms, a sewing room or servant’s room, and five full baths. In the expanded basement beneath the new library, Shutze also created a “playroom,” which was used by the Hill’s teen-aged daughter for parties. A half-bath was added with the playroom but an earlier bathroom, furnace room and wine cellar remained in the basement beneath the original kitchen wing of the house. The house’s original (1913) plaster walls and ceilings and woodwork were almost completely replaced by Shutze’s exquisite, custom-designed millwork in 1933. The service staircase and its balustrade may be the only original woodwork left in the house. All of the doors were replaced, although Shutze used one of the original exterior doors in the attic at the skylight shaft. The door, which has full-length, beveled, plate glass, still has its original lock-set and ornately-decorated escutcheons. The original, double-hung, 1/1 windows were replaced along with all of the interior window and door casings. Baseboards and mantelpieces were also replaced and new plaster cornices were designed for the stair halls, living room and dining room. In addition, Shutze designed numerous cabinets, bookcases, and other interior features, including the magnificent linen press which is a major design feature of the second-floor stair hall. Walls and ceilings are plaster except in the library where the walls are paneled with wood. Athos Menoboni, the celebrated, Greek-born painter who decorated many Shutze houses in the second quarter of the twentieth century, painted the walls of the rotunda. Using an Oriental motif and signed and dated 1933, the rotunda painting remains one of the most significant features of the house. In the new room above the library, Shutze had the walls and ceilings decorated for what was to be the Hill’s daughter’s bedroom but the decoration is no longer visible and may have been lost entirely. All of the rooms in the house have been redecorated repeatedly, especially since the Hills died in the 1960s, and some rooms have been recently re-plastered. While the original kitchen, scullery and butler’s pantry were combined into one space in the 1970s, fine period bathrooms remain in use. The second-floor bathrooms still contain most of their original cabinetry, including a dressing table that Shutze designed for the Hill’s daughter, as well as original pedestal sinks, corner tubs and showers. One bathroom contains all of the original fixtures, including the toilet, all of which are blue porcelain. Although common after World War II, colored bathroom fixtures were just coming onto the market in the early 1930s. Two of the 1933 toilets and what may have been a base cabinet from the 1933 kitchen are in storage in the furnace room. Other changes since 1933 have been relatively minor. The side porch was screened by the Hills but it has not been enclosed. Shutters were added to the front windows in the 1960s but these have since been removed.